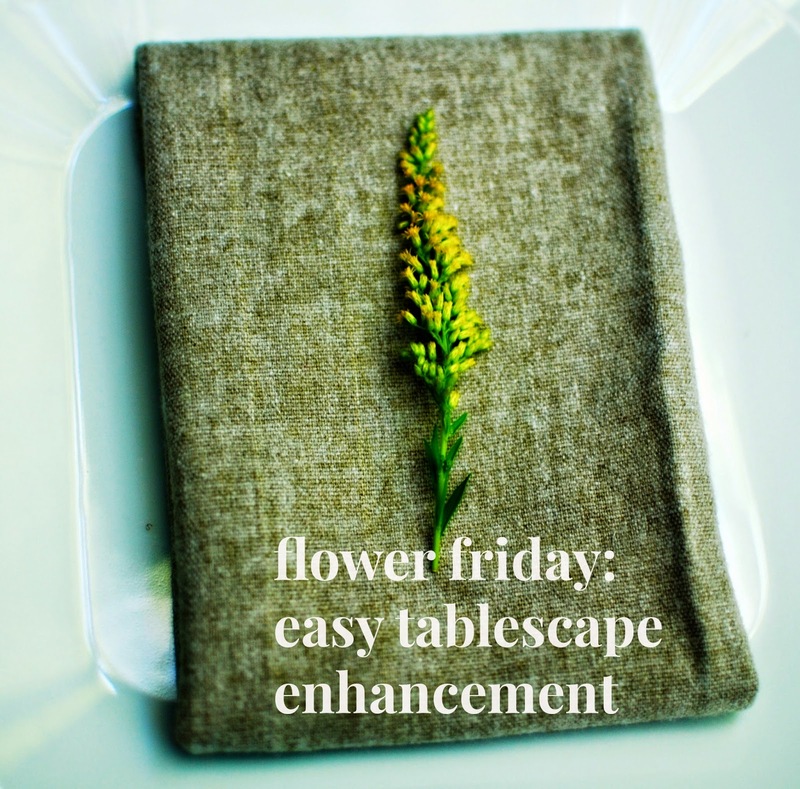 For this weeks Flower Friday (and if you're interested in seeing the past Flower Fridays, you can find them HERE and HERE) I took a simple $3 bouquet of what might look like "filler flowers" to enhance a neutral place setting. I may have mentioned it before, but if there was a job that entailed of only creating small tablescapes for dinner parties I would totally be on board. There's something so fun and intimate about personalizing a dinner for just 6 or 8 people. Basically, if anyone needs help with their tablescape design just call me. Step 1 on this super simple place setting is to buy one bunch of filler flower like the yellow Aster I have featured. And no, I didn't know this was called Aster until I bought it. ...and lay a single sprig or even a couple on your napkin. The neutral napkin color and yellow Aster would be a perfect combo for a rustic tablescape. Babys breath has a bad rap but I think it can be adorable if used right (ahem see below and HERE for another shining example of Babys Breath gone RIGHT). ... and I tied my flower around the napkin which turned out pretty cute. Again, think free and easy! For this edition of Flower Friday I used neutral colors but this would be so cute for a spring table or a Mothers Day brunch. I'm picturing pink roses or a yellow Lilly. Now I want to experiment with more napkins and flowers...again, I'm just so darn cool these days. Happy Mothers Day to you if you're a Mom or an expectant Mom - I hope you feel loved and appreciated on Sunday! This post is actually a complete tutorial regarding enhance a place setting and this will be full of fun and creative activities which are good for us. Any how, I try to find college-paper essay service review and at the same time some learning stuff i got from this site.